AMC is bringing it’s “dine-in theaters to NJ, but they’re only coming to central jersey for now. I wanna try this even if it means going down to Bridgewater just for a movie. A stockpile of 2600 tons of mercury has finally been relocated out of Hillsborough, NJ. Only took 50 years…. Speaking of odd jobs, apparently people go around the state gathering acorns (fighting off squirrels) so they can plant them and keep oak trees alive. I once was young and stupid. (note: I’m now old and stupid). I stole road signs and dropped bowling balls from great heights. But I still can’t help but be amused when idiot teens get busted for… I dunno… stealing stuff for a scavenger hunt. Finally, the state has decided that the best way to handle the over 20,000 toxic waste sites is to farm out the cleanup to private contractors and let the DEP handle only the worst of the worst. Yeah, I can’t see anything wrong with that. 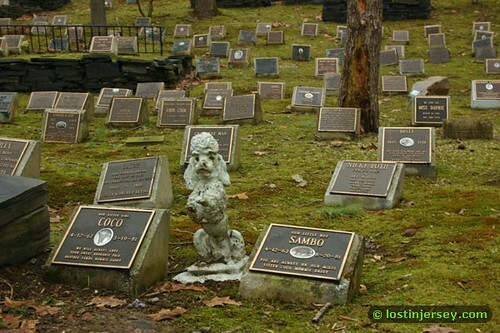 The Hope cemetery has some graves that go back as far as the American Revolution. It is believed that if not for the efforts of locals to preserve it, it will succomb to the grass and dirt and weather and be lost forever. I don’t really know much about the cemetery or it’s history. I can tell you that they accept all manner of animals including horses and gorilla, though the primary pets buried here are dogs and cats. 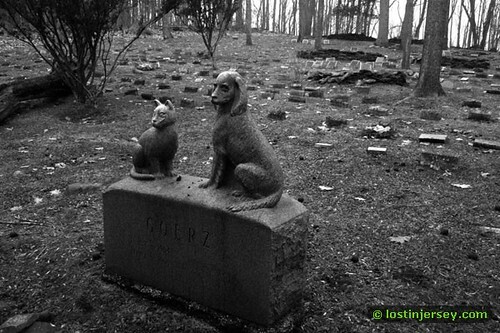 The pet cemetery is off limits to the public, something I only discovered after wandering around. The sign is located once you get to the parking lot, and near the road (which would make sense) Needless to say I parked and headed to the right, never seeing the sign till I came back to my car. The town will erect a low, stone wall around a 300-year-old cemetery, laying to rest a two-year battle between historians and residents. Council members said they wanted to protect the historic Haring Cemetery, which dates to the 1700s and contains the remains of Bergen County’s earliest settlers. The area, which is in the middle of several back yards, was previously unmarked and overgrown with trees and weeds. The cemetery, located off Meadow Lane, has been a source of controversy as historical groups and neighbors argued about how to best preserve the site. Historians were concerned that additional stones have been covered up over time. They lobbied to erect a fence around the cemetery while the neighbors feared such delineation would create an eyesore. The borough council decided that a wall made of Belgian block less than a foot high and 66 feet square would be a fair compromise. Robert Garner, a neighbor of the cemetery, who had initially opposed the fence, said he was not present at the meeting. He is now having trouble confirming the height of the fence. “If it will be 4 to 6 inches of a cobblestone that blends into the area, then we will be satisfied,” he said Monday. Ownership of the cemetery can be traced to John Haring. When he died in 1802, he didn’t deed the land to anyone. 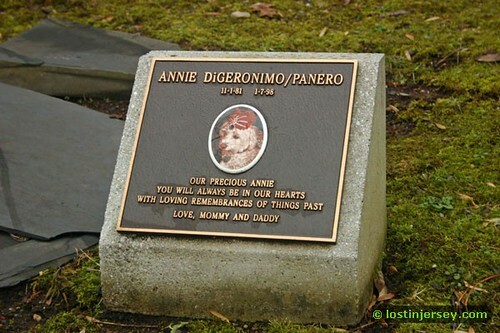 For years the cemetery was ownerless. A small roadside cemetery. I don’t know anything about it and the research i did yielded no information. It was likely an old family plot on a farm which was sold off bit by bit till nothing of the family estate remained but the cemetery. The area was originally settled by the Wilcocks family, who ran a grist and lumber mill. A small cemetery plot with four gravestones dating to the 1700s is the only evidence of the earliest settlers. It is believed that it became abandoned at some point before again becoming occupied in the 1800’s. David Felt rebuilt mills and began a book and paper processing center, which furnished products to the New York stationery business. It is presumed that in these 11 houses that were built, 4 families lived in each house. There was one building that served as a general store, school, and church for the residents of this village. In the 1860’s Felt sold the village, and it was sold several times over in the next 20 years. It eventually ended up in the hands of a man named Ackerman who renamed it Glenside Park. He tore down most of the buildings and built new ones more suited to farming and raising cattle. The old mill was used as a stable until it become structurally unsound and was torn down in the 1930’s. The barn was built in 1882 to house horses and carriages which would transport business men to the train station.Glenside park flourished until 1916. In the 1920’s, the Union County Parks Commission purchased the property. The houses in the village were rented out to families until the 1960’s. The village was listed on the State and National Registers of Historic Places in 1980. The barn is now home to the Union County’s own Operation Archeology. There is a large water tower nearby, and although there was only one confirmed suicide, it has been nicknamed “Suicide Tower”.